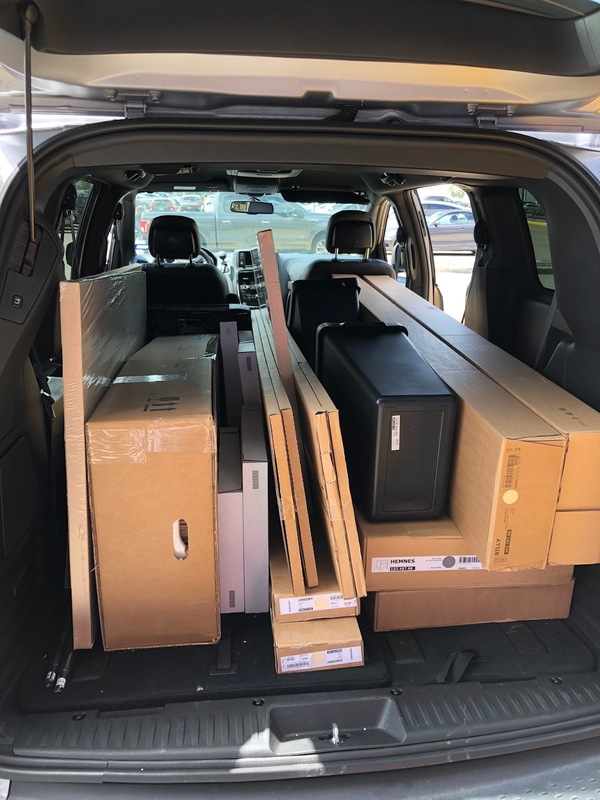 When we first met with our contractor about doing an update/renovation to our house, he told me that we basically had to pack up like we were moving. Only we weren't, which meant the boxes had to go somewhere - in our case, one of the spare bedrooms. That room was only going to be painted and get new carpeting, so it would be a good staging area. I was excited to pack, because that meant that we were getting closer to this becoming real. I packed and packed, listening to podcasts and books on Audible, and that spare bedroom started getting really full with boxes. Jeff spent one entire weekend packing up his office and closet, and the spare bedroom's closet, and still, we had stuff left to pack...and that spare bedroom was really full. While I had most of the kitchen packed, I'd left out a few Fiestaware plates and bowls to use while we were waiting for the reno to begin, plus the pots and pans, mixer, pantry food...no big deal. My plan was to put the remainder of the kitchen stuff in our oversized bathtub - after all, we don't use it, so why not stack everything in there? Seemed like a good idea to me. Well, our start date for the renovation got moved up by a week, which I was happy about - but that meant we had to kick it into high gear to get everything packed, as well as buy the items the work crew would need for installation. Because of Jeff's work schedule, we had one day - last Monday - where he was available to go to Houston, which is at minimum a 90 minute drive away, if there's no traffic (haha, famous last words: Houston and no traffic). This was the day after we'd run the Texas 10 Series race. That afternoon, we packed like madmen, then woke up early on Monday morning, picked up a rental van, drove to Houston, got to Ikea and went to town getting everything we needed - top priority were the bathroom vanities and sinks, with the oversized items that we can't fit into our own vehicles next. I was so organized and had a detailed list...which I ended up leaving on the kitchen counter, ack. The list was also online thanks to Ikea's shopping list app, but their website was really slow so we weren't as fast as we could have been with the printed out list. Still, we only had to figure out some extra details on Jeff's desk, and we made good time, or so I thought. We arrived at 10:30, and hit the self-service area at 12:30 - and suddenly it was 2:00 when we were standing in the checkout line. I think Ikea is a lot like a casino in Las Vegas - you lose all concept of time there. The shopping basket AND the cart all belonged to us. Oh and we had to go pick up the vanities and sink tops from a different area. Our new friends are behind Jeff. I had to laugh at the expression on both of the men's faces...hey, Ikea will do that to you. There was still room left - we could have bought more! Actually, we did - knowing we had the van, we stopped at Lowe's when we got back into town and picked up a small storage shed that Jeff wanted. And a light fixture, just for good measure. 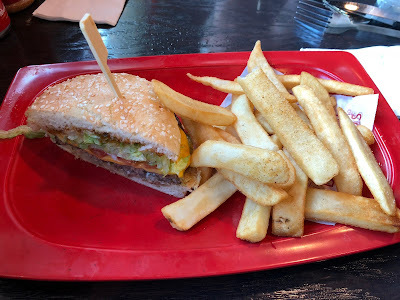 I love their red relish on the burger, YUM. 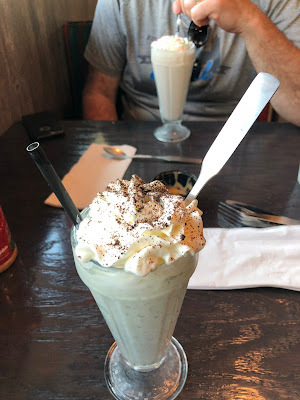 And we also got milkshakes, which kind of put the hurt on us, but we soldiered through and finished them, LOL. Once we finally got home, we had to unload the van and get it back to the car rental place - and then I still had the last bit of the kitchen to move to the bathroom. Easy, right? I swear, everything kept multiplying - the more stuff I took out, the more stuff seemed to appear. And this was after I'd packed so much already! I finally finished at 11:00 that night; although I'd worn my Hokas to Ikea, my feet and legs were killing me and it took several days after that to recover. It was a crazy day and I'm glad we got through it, just in time for demo to start the next morning! Sounds like quite the workout and I think you earned that milkshake! How exciting and I can't wait to see the finished product. There should be an IKEA workout at crossfit, LOL! OMG what a crazy day! I am surprised you are not STILL recovering from all that. Gah, shopping at any place for all that stuff will leave that expression on your face. It's EXHAUSTING. It's exciting it all got moved up though, and will be done sooner. We were exhausted - it took several days to finally feel normal again. I can't wait to see all this come together! I told Jeff that it's a good thing we were able to do this all at once, because if we had planned on doing, say, the kitchen first and then the rest of the house in a couple of years, I don't think I would have gone on to the rest. So much upheaval, best to get it all done at once if possible. While I totally envy your renovations and upgrades, I totally DO NOT envy this. Or your dust. And now I understand why our friends who did a fairly big reno a couple years ago, moved into a hotel for two solid weeks. I guess your new mantra should be "it will be worth it in the end!" Dang, I kinda wish we could just move out for a bit! That would be a nice way to handle a renovation, for sure. And I do keep telling myself that in a month, we are going to be so happy we did this. That WAS a crazy day! The burger and milkshakes, though, totally worthy :) The one good thing about packing up everything, it makes you clear out some stuff. And still, a few years, later, my house is much more organized and less cluttered than it used to be. We were clearing out the last room, the guest room, over the weekend, and when we were pulling stuff - momentos, mostly - out of the closet, Jeff had to stop me from tossing things...I was at THAT POINT. But I definitely will revisit everything before putting it back, just to see what I could cull. Wow! I have yet to visit IKEA but I know I need to! Looks and sounds like a successful shopping trip! I have a love/hate relationship with packing because I like getting rid of things but it’s kind of a pain to do! Haha! Wow that's a lot to squeeze into one day! Hannah tells me all the time I have too much stuff, and most of the time I agree with her. She'll box stuff up and not tell me what's in it - she said if I can't find something I can ask her and she'll find it for me. If I haven't mentioned said item in six months, she says its going to charity! Hannah has the right idea - not only am I getting rid of a lot of things, but I'm working hard to not bring more into the house. I was at Target last night, saw a few cute items, but flashed back to all the STUFF I have that is currently stuffed into boxes, and that made it an easy pass. Now if I can just keep remembering that! What a busy day! You handled it like a champ though. Milkshakes are totally worth it sometimes. Now that was a productive shopping day! When I did a house flip, I opened a 6-month interest free credit line at Lowe's and I had to spent $1000 to get that. What a fun day that was shopping my heart out for home stuff LOL!